Last week, we got a call from a small family in the area that was looking for a moving company to help them move about 300 miles away. The mom was looking forward to the move because they would be living near family, but she already had a lot going on and planning the move would be stressful. She asked if we had any suggestions for making the move easier, some kind of list that would be easy for her to print out. We didn’t at the time, but hopefully this list will help you. -Decide how to move your vehicle- if you get a moving company, you can drive your vehicle, but there are options for additional vehicles such as shipping companies. It might take some research, but a moving company should have information to help, so be sure to ask. -Gather all of the belongings you want to sell or get rid of. 2) Keep track of everything- a moving notebook is a great idea. 3) Start organizing your belongings- what do you want to keep, what will you need to replace. 4) Choose a date- mark it on your calendar. 5) Buy any packing material you will need. 6) Hire a mover- give yourself time to research the best option for your investment. 7) Start packing- keep a list of what still needs to be packed, what already is. 8) Mark everything- this will save you a lot of time if you need to retrieve something, or find something in your new home. 9) Make a list of places to change your contact information. 10) Set aside all important documents- depending on the distance of your move, you may need them handy, but you will definitely need them for schools, etc. 11) Research schools in the new area. 12) Mark the calendar for changing your address with the post office. You’ll want to organize your moving notebook to include a list for each topic listed above, then you can quickly go back and forth between lists, marking things off as needed. When there are so many things going on at once, it can be difficult for anyone to stay on top of each thing to make sure it is done, done correctly, and nothing gets forgotten. Give yourself some slack. Once your move is over, things will get back to normal. 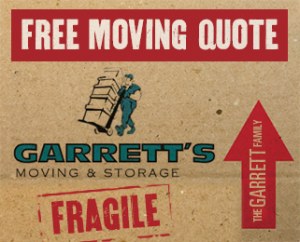 Garrett’s Moving and Storage are Dallas movers with over 20 years of experience of moving in Dallas and across the country. We are BBB accredited so you can have peace of mind knowing your belongings will be in good hands. We also have a best-in-the-industry insurance policy. Contact us today at 972-487-5843 for a free estimate or click here to request a quote online from the leading Dallas movers.